Innovated Energy Controls is a full-service electrical contractor providing services in the commercial and industrial industry. Licensed and insured, we specialize in BAS. Headquartered in Howell, Michigan, we serve Southeast Michigan. 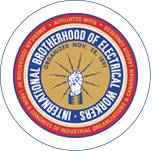 We are a Union Contractor out of the highly skilled workforce of the International Brotherhood of Electrical Workers (IBEW Local 58 Detroit). In addition, we are also affiliated with outside locals and do work in their regions. This includes Local 252 Ann Arbor, Local 665 Lansing, Local 948 Flint, and Local 8 Toledo.